*The total amount payable for prizes in a category is limited to $300,000 per draw. If this limit is reached, the prize amounts will be determined in proportion to the number of winning selections in the category. 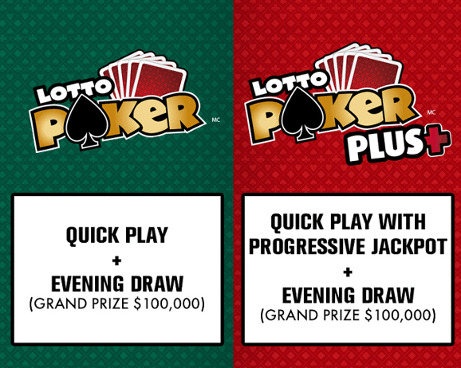 Progressive jackpot starting at $10,000. No bluff! Each Plus option bet increases the progressive jackpot, which starts at $10,000 and is reset to that level once the jackpot is won. 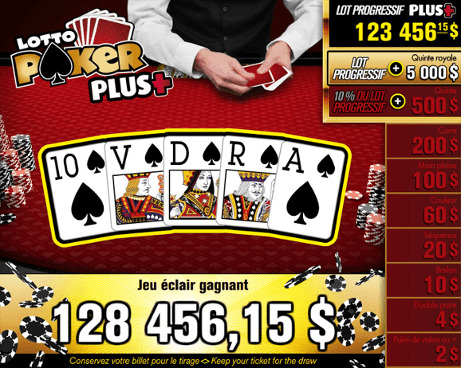 The progressive jackpot is won with a royal flush when the Plus option has been purchased for the hand. It increases according to the number of participating selections and varies when prizes are won in the enhanced structure. The purchase of the Plus option applies only to the Quick Play prize structure and not to the draw. Each selection (a 5-card hand) costs $2 and allows you to participate in a Quick Play and in one draw. 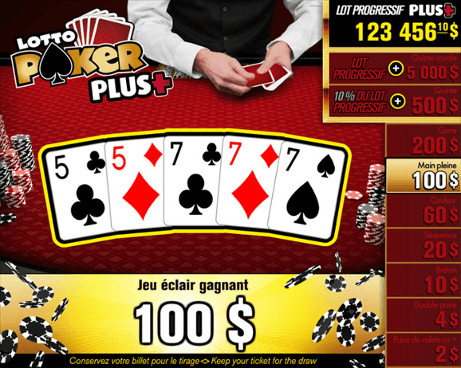 The Plus option costs $1 more for each selection and provides access to an enhanced prize structure for all ranked hands, from suits to royal flush. Up to 3 selections may be played per ticket. All cards on a ticket come from a single, regular 52-card deck with four suits (Hearts, Clubs, Diamonds and Spades) of 13 cards each. The same card cannot be used for more than one selection on the same ticket. 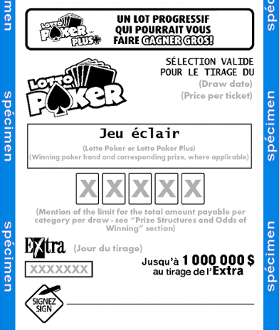 Quick Play is a game that is randomly generated by the Loto-Québec computer. When your transaction is being processed, your selection(s) will be shown on the screen. A selection is a winner if it forms one of the poker hands that are described in the applicable prize structure (see the Prize structure and odds of winning). Each draw is conducted as follows: Loto-Québec conducts a draw to determine at random 5 cards among the 52 cards of an ordinary deck. A selection is a winner if it contains 2, 3, 4 or 5 cards identical to the cards drawn (see the Prize structure and odds of winning). 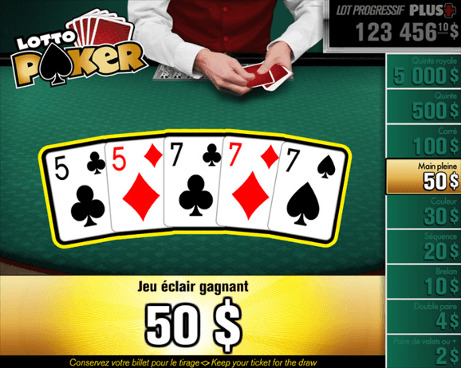 In Lotto Poker, the cards are always presented in increasing order, according to value (from 2 to Ace) and in the following order of suits: Hearts, Clubs, Diamonds and Spades. You must pay before Quick Play starts. It is impossible to cancel a Lotto Poker ticket. 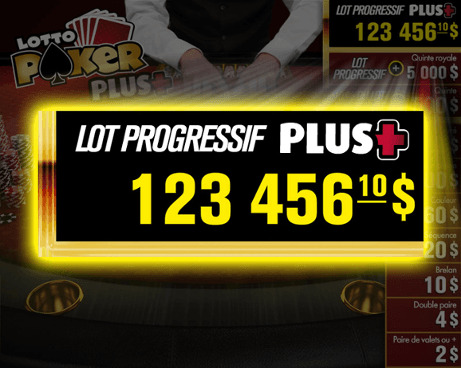 Lotto Poker is governed by the By-law respecting forecast contests and numbers games, published in the Gazette officielle du Québec, which includes limitations of liability. *Cards shown for demonstration purposes only. **The 4 suits are: Hearts, Clubs, Diamonds and Spades. In increasing order, the rank of the cards is as follows: 2, 3, 4, 5, 6, 7, 8, 9, 10, Jack, Queen, King and Ace. However, an Ace may be used to complete an Ace-2-3-4-5 straight flush or straight. ***Fixed prizes. 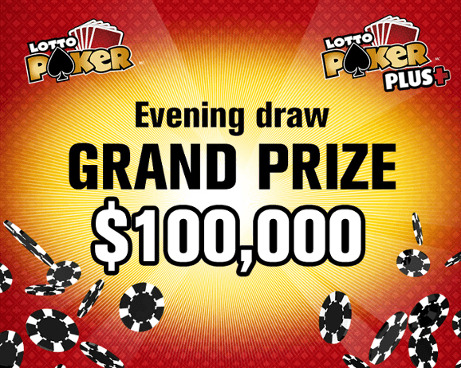 The total amount payable for prizes in a category is limited to $300,000 per draw. If this limit is reached, the prize amounts will be determined in proportion to the number of winning selections in the category.